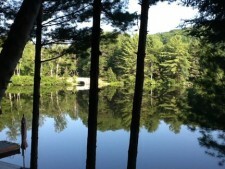 As summer draws to a close, we try to squeeze in every bit of rest, leisure and sun before the fall routine begins. With the space we have created in our lives with vacations and a slower pace, the ideas should be percolating – and flowing more freely – than when we are immersed in our daily jobs. The beauty of summer may have inspired you with its flowers in full bloom, fruits and vegetables growing and ripening, peaceful lakes to gaze upon, gentle meadow vistas or cool shady woods to enjoy. The birth month flowers for August are the gladiolus and the poppy. The name gladiolus is derived from the Latin word “gladius”- meaning sword – and is therefore known as the “sword flower” for its sword-shaped leaves. It has funnel-shaped, brightly-colored flowers on one side of the stem. The recipient of this flower is said to have their heart “pierced by love”. 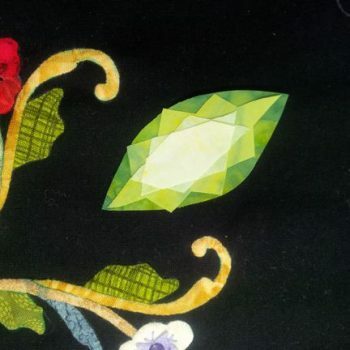 This was a rather difficult flower to depict in a quilt – and I’m not sure how realistic my fabric version looks – but I definitely included the sword-shape leaves! 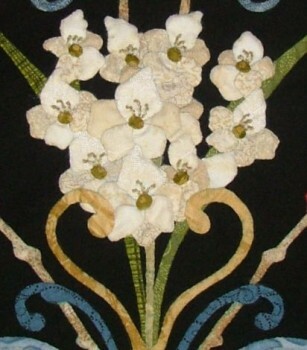 Green Apliquick-turned circles were used to create the center of the “funnel” along with hand embroidered stamens. Poppies are the other birth flower for August. To Canadians, the red poppy stands as a symbol to never forget those who have fallen in war or military operations. 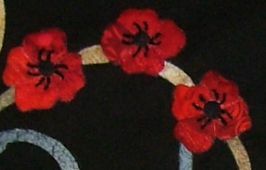 Even though we set aside a day in November for Remembrance, I still had to make my August poppies red. Here is August in my time quilt. The birthstone for the month is the Peridot. It is a bright lime green – one of the few gems that comes in only one color, although it does vary by shade – and is one of the oldest known gemstones. The finest of these stones is nicknamed “evening emerald” because it seems more green under artificial light. Here it is on my time quilt at the 8 o’clock position for the 8th hour, the 8th month. As summer vacations are winding down, we mentally gear up for Autumn’s structure with a back-to-work or back-to-projects attitude full of fresh energy and ideas. 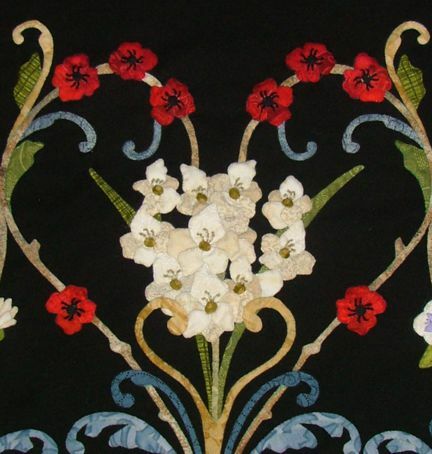 I hope you have had a wonderful, relaxed and beauty-filled summer, gaining new inspirations for your quilting projects.